Alghero is filled with towers and among the lot, this is one of them. 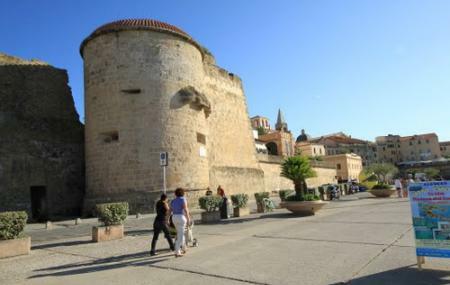 Also known as Garibaldi Tower, it is located along the Sea Walls, this tower was constructed in 16th century. The significance of the tower is it houses the memorial stone that immortalize the arrival of Giuseppe Garibaldi (who was in command of Lombard merchant fleet) in the city, in the year 1855. Beside the tower, you can see the remaining of a fort, bearing the same name. History says, it is the only one to have survived the strong invasion of Spanish for three times. The fort used to work has a strong safeguard in protecting the northwestern part of the city. From the exterior walls, you can still see the channels that were used to throw boiling oil or water on the enemy below. How popular is Torre Della Maddalena? People normally club together Sea Walls and Anghelu Ruju while planning their visit to Torre Della Maddalena. The old town of Alghero is full of history. Every single tower is amazing and worth seeing.